Root canals save at-risk teeth, but it's not always easy to tell if the treatment is necessary. Read below to learn if you could benefit from the procedure, and call the Florissant, MO, dental office of Drs. John, Joseph, and Jenn Boain of Boain Dental Care if you believe that you could. How to tell if you may need a root canal? Root canals are performed if you have an infection or inflammation in your tooth pulp (a soft mass of tissue, nerves, and blood vessels at the center of the tooth). If you don't receive treatment for the infection or inflammation, you will eventually lose the tooth. During root canal treatment, your dentist removes the pulp, cleans and shapes the root canals, and adds a flexible rubber filling to the tooth. Luckily, your tooth will continue to function normally even if the pulp is removed during a root canal. Pain When You Chew: Initially, you may only notice pain when you chew or press on the tooth. After a while, the pain may occur more often or become constant. Although pain can be severe, milder pain may also be a sign that you need a root canal. Swelling: The gum around a problem tooth may become red, irritated, and swollen. Discoloration: An issue with the pulp may cause a change in the color of a tooth. It's always a good idea to pay a visit to your Florissant dentist if you notice that one tooth has become darker than the others. Sensitivity: Anything you eat may cause your pain to flare up. Sensitivity to both hot and cold foods and beverages is a classic sign that you need a root canal. Injury: Root canals may also be needed if you injure a tooth or a knocked out tooth was re-implanted. 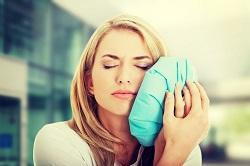 Abscess Symptoms: An infection in your pulp can trigger a variety of symptoms, including pain, fever, facial swelling, swollen lymph nodes, pimples, or pus on the gum next to the painful tooth. Do you have any of these signs and symptoms? Call your Florissant, MO, dentists at (314) 921-3527 to schedule an appointment.